INDUSTRY.co.id - Jakarta - On the title of Indonesia FSC Week 2017, President Director of Perum Perhutani Denaldy M Mauna invites wood and community consumers to care for forest sustainability by using products made from raw materials managed by companies in a responsible environment. According to Denaldy M Mauna, consumers today are no longer just looking at prices as a determinant factor in product selection, but also trust in companies that are environmentally friendly and have a social commitment. Consumers can apply environmentally friendly insights in each of their consumption actions. Based on the results of the Nielsen survey of 2015, 66% of global respondents are willing to pay more for products and services that come from socially and environmentally positive companies, up from 55% in 2014, including Z-generation (15-20 years) increase to 72% compared to the year 2014 by 55%. "Anyone can participate in preserving the forest. 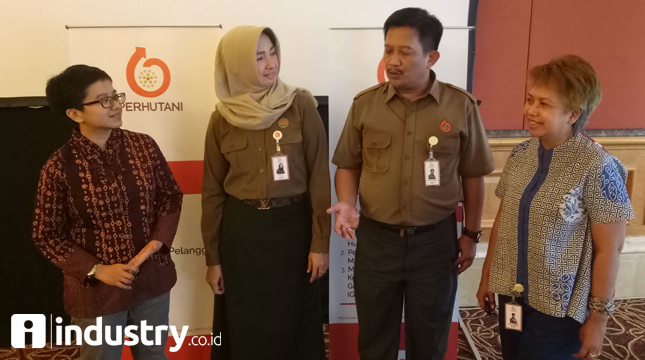 The simple thing that can be done is to use products that clearly come from reliable sources and provide social benefits for the community Information to identify environmentally friendly products is already in the market" said Denaldy in the middle of the Indonesia FSC Week 2017, Monday (9/25/2017). Forest management Perhutani has implemented ten principles of Sustainable Forest Management referring to the International Forest Stewardship Council (FSC) standard. Even in 1990, Perhutani was the first forestry company in the world to be certified International Sustainable Forest Management by Smartwood Rain Forest Allience, a forestry certification body from the United States. Although the certificate was suspended at the beginning of the 1998 reforms due to forest looting cases, Perhutani was able to make continuous improvements to regain FSC certificates in 2011. Total wood production Perhutani FSC FM / CoC certified in 2016 reaches 120 thousand m3 consists of teak wood 100 thousand m3 and 20 thousand m3 of jungle wood, while until August 2017, Perhutani produce 101,000 m3 certified timber consisting of teak wood 91 thousand m3 and jungle such as Mahogany, Sonokeling, Johar, Acacia, Trembesi, Sengon, Gmelina as much as 10 thousand m3. All of the Perhutani timber in the form of round wood or LOG is sold through the online system at tokoperhutani.com. "We produce raw materials whose sources are guaranteed to meet sustainable forest management standards to serve consumers who are increasingly aware of the importance of environmental sustainability," said Denaldy.